Provo • On successive plays Friday night at BYU’s preseason training camp, freshman quarterback Zach Wilson lofted passes to tight ends Matt Bushman and Moroni Laulu-Pututau, the latter reaching high to snare the football over the outstretched arms of an overmatched defender. 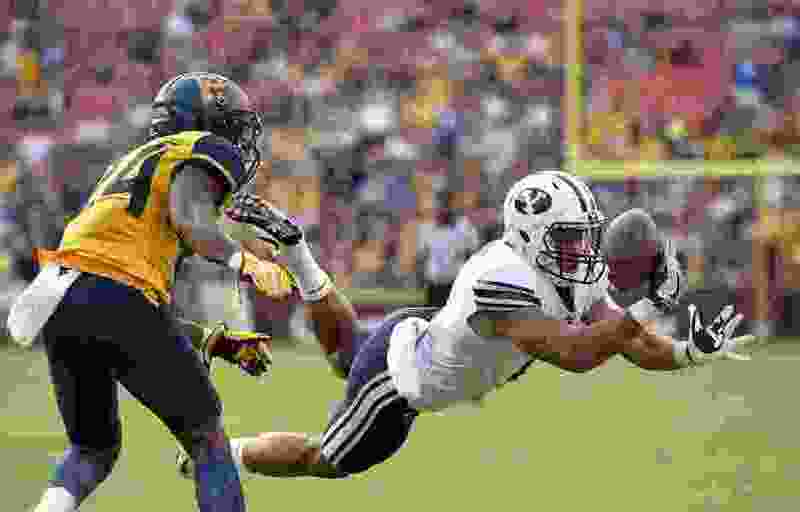 The Cougars could have used that kind of one-two punch at one of their marquee positions last year, but the 6-foot-5 Laulu-Pututau — known as MLP to teammates, coaches and media members who have trouble pronouncing his full name — missed the entire season with a Lisfranc foot injury. Then-offensive coordinator Ty Detmer didn’t like to use excuses for his abysmal offense in 2017, but in one moment of weakness the former Heisman Trophy winner wondered aloud what might have been if Laulu-Pututau hadn’t injured his foot three days before the opener against Portland State. “Having them both on the field was a big part of what we were trying to do,” Detmer said. New offensive coordinator Jeff Grimes has inherited that luxury, and it is already evident through a couple days of camp that he plans to get all he can out of the freshman All-American Bushman and the uber-talented Laulu-Pututau, who played receiver his first two seasons before moving to tight end. He caught 27 passes for 277 yards and two touchdowns in 2016. Last summer was glorious for the former Mountain Crest High product. He got married and ate pretty much anything he wanted in an attempt to gain weight to play tight end, going from 210 pounds to 245. That all changed on Aug. 23, three days before the opener, when he felt a pop in his left foot while running a routine non-contact passing route. At first he thought the pain he felt iwas a cramp in his foot, or a defect in his cleats. It was the curse of the Lisfranc fracture, a mid-foot injury that really isn’t a fracture. One or more of the metatarsal bones in the foot is displaced from the tarsus, so it is more like a ligament tear than a break. (Francisco Kjolseth | The Salt Lake Tribune) Moroni Laulu-Pututau is interviewed by the media as BYU hosts their eighth-annual football media day at the BYU-Broadcasting Building on Friday, June 22, 2018. “I just know it hurts, and it is serious,” said the construction management major who knows all about the dangers of putting too much load on a structure not equipped to handle it. And it severely hurt the offense, which couldn’t even move the ball across the 50-yard-line in the second game, against LSU. 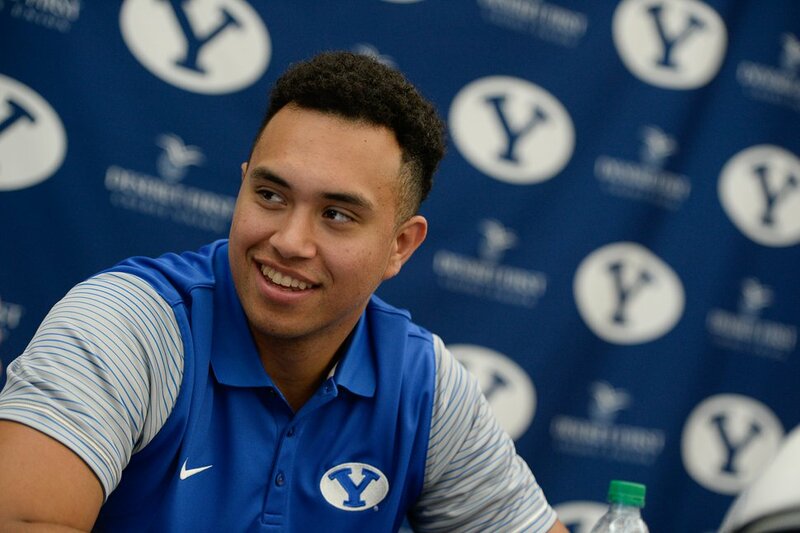 Laulu-Pututau said he couldn’t have made the return without the support of his wife Kiralyn and the help of BYU’s trainers and medical staff. Laulu-Pututau said he has been fully cleared by the medical staff and has done everything so far in camp, but is still being “cautious and smart” after what happened last year. Watching from the sidelines has given Laulu-Pututau plenty of time to think about that awful day. For MLP, the more pressing matter is learning Grimes’ new offense.